After Ball Nogues Studio read the article by Diederichsen in Art forum from which the quote above is pulled, they decided to create Spock’s Blocks. Spock’s Block’s is a tribute to the rationality and calm detachment of the First Science Officer of the Starship Enterprise, Star Trek (our apologies to Diedrich Diederichsen). Comprised only of strings and ink, we employed Spock-logic to construct the lightest wall imaginable – an ephemeral architecture that mirrors the modular units of stone at the Entrepôt. 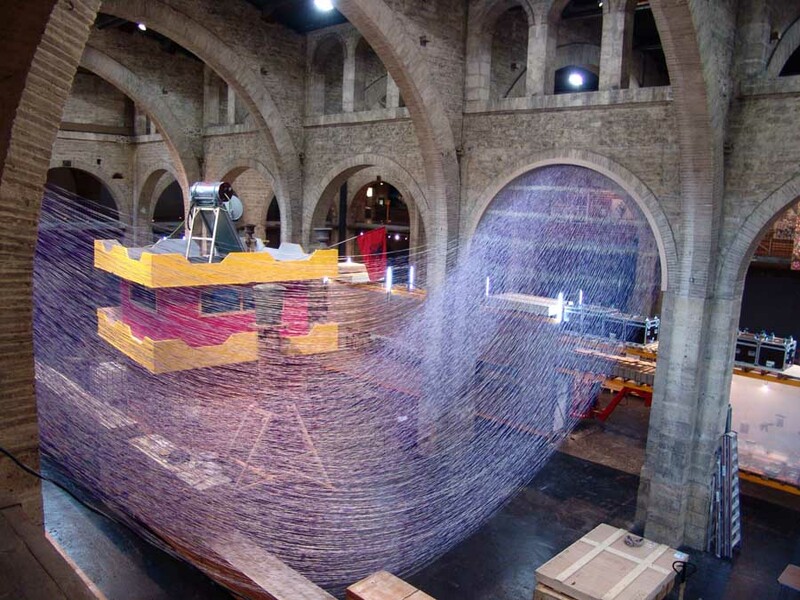 The complex system of overlapping catenary curves were cut and printed by a computer-controlled machine-Instal_lator with Variable Information Atomizing Module- that we designed and fabricated to yield “printed” visual and spatial effects. 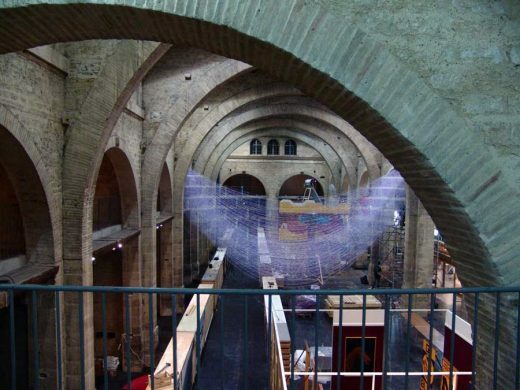 From 9 October 2009 to 7 February 2010 there will be an exhibition at the Entrepôt in Bordeaux co-organized by arc en rêve centre d’architecture and the CAPC contemporary art museum, as part of the Bordeaux urban arts biennale Evento. The CAPC & arc en rêve, the architecture centre and the contemporary art museum have worked together to create the exhibition Insiders as part of the first edition of Evento, the Bordeaux cultural and urban biennale. Insiders and Evento are interrelated, both focusing on the theme of “the private and the collective”. Insiders brings together over eighty architects and collectives from a variety of backgrounds who have in common ways of overstepping the frontiers of their respective disciplines. Like the early folklorists, contemporary artists have explored ways of collecting a variety of cultural materials, while architects offer alternative approaches relating to new ways of appropriating the city and architecture itself. This selection is the result of a survey in the fields of art and architecture and focusing on the relationships and influences that link “high” culture to “popular” culture. Insiders responds to current world social and economic issues and models of global culture by exploring new and singular dynamics of exchange and organization that bear the potential for new collective values. In architectural terms, Insiders focuses on knowledge and expertise as they directly relate to modes of use. The aim of arc en rêve, ten years after the major exhibition entitled MUTATIONS, is to highlight another phenomenon this time involving the revenge of “localness”, the construction of new types of narrative, and the search for new ways of being together. The current economic crisis, coupled with heightened egological emergency, gives Policy a central role. Civilizational changes no longer take place thanks to market pressures alone, but under the impulse of populations that are organizing themselves and initiating new ways of producing frameworks in which to live. Locally and in networks, a variety of experiments are defining new territories for projects and new ways of relating to others. From these new conditions for architecture, which in spatial and temporal terms addresses the finiteness of the world, arise new ways of thinking about design and production; they cut across disciplines and function in direct contact with inhabitants. The selected works on show reflect alternative ways of approaching the profession of architect. These “explorers of the everyday” have embraced a form of democratic commitment and set out in search of a new world: a world of greater solidarity and citizenship. They open up their professional work to the aspirations of ordinary people. The position of these architects involves refusing the status of mere “project executor”. They lay claim to the project in a different way, as part of an ongoing process in which knowledge is shared: a truly collective work. How does art relate to popular culture today? For several years this has been a key questionin the various components of the CAPC art programme. After investigating the relationships between art and Sunshine Pop, architectural utopias, the esthetics of suburban housing in the Seventies and Eighties, French psychedelics, and cinema and theatre as exhibition systems, the museum is now broadening its investigation with Insiders. This exhibition examines how art forms and cultural practices are embracing and reviving the notion of folklore. In a world transformed by the Internet revolution, where the amateur and professional spheres intermingle and where “today’s mass culture [would be] tomorrow’s folk art” (Mike Kelley), the role of the artist seems akin to that of a nomadic seeker, trafficking at the intersection of different disciplines and in ever more singular contexts. The infinite repertoire of forms, images, actions and techniques from which artists can draw enables them constantly to challenge the frontiers of art while at the same time reaffirming its specificities. This selection is the result of a survey in the fields of architecture and urban design focusingon the relationships and influences that link “high” culture to “popular” culture. It is truethat it reflects a period marked by deep concern for the future: a time that is saturated with references and dominated by imperatives of awareness and environmental ethics. Both incomplete and representative, this collection focuses on themes that belie its underlying preoccupations: recycling, passing things on, participating, celebrating. It shows that it is possible to build differently, highlighting as it does alternative techniques that blur the frontiers between professional and amateur work, creating new approaches and thus new forms. How does bringing together these two habitually distinct forms of culture call the discipline of architecture into question? Does it enable architecture to go beyond itself, to find new approaches that are better equipped to serve emerging uses and lifestyles, to address the needs of the most deprived members of society, to find new territories so that it can begin telling its stories again? ways. These are architects (qualified or not) who seek out areas of free experimentation, marginal and precarious situations, zones that escape control, and land “devoid of qualities”. They invest public space that is all too often confiscated, organising and perpetuating collective uses and festive rites. They readily draw their inspiration from traditional crafts, models of informal architecture, and self-building. They forge new links with traditional expertise, with ornamentation, with the vernacular, and with craftsmanship. They engage in new forms of social and political commitment, making constant use of experimentation, opening their work up to daily life and the wishes of the greatest number, getting people to participate and working within random or indeterminate timeframes. These architects open up new perspectives, clearing a path through the world of the future and helping us to inhabit it more effectively. Since the first investigations carried out in 1804 by the Académie Celtique, whose job it was to collect the traditions, customs and languages, followed by the introduction of the termfolklore by William Thoms in 1846, the notion of folklore has always constituted an alternative to central power, and has always been associated with the definition of local identities. It is the setting for a symbolic confrontation: popular knowledge versus the knowledge of an elite eager to preserve the notion of universalism. For this reason the exhibition deliberately reflects a change in civilization where the rules of the old division between “dominant culture” and “counter- cultures” has evolved: working as a network within a global system, current folklore-related practices in the field of art proceed by appropriation and transformation, delocalization and relocalization, intermingling and recycling. Insiders are members of a small group of people who share knowledge that is protected by precise codes of transmission. Unlike the expert, whose position is more remote, insiders have in their hands the raw materials of the cultural context to which they belong and which they can legitimately observe or represent. The circulation and transformation of these forms of knowledge are part and parcel of what this exhibition sets out to present. In order to understand these approaches, the overall method of the Insiders project is based on the principle of on-the-spot investigation, after the manner of the early folklorists who worked in their own particular areas using techniques of observation and inventory. To bring this method of investigation up to date, a number of “observer/participants” (artists, curators, collectors, collectives and so on) in various parts of the world have been asked to share their experiences. We have chosen to address each of the selected projects from the point of view of their methods, approaches and expertise, providing an inventory of the types of action they involve: amplification (augmenting, adding on, etc), bricolage (do-it-yourself, dismantling and reassembly, transforming, adapting, developing, etc), celebrating (commemorating, parading, initiation, etc), exchange (borrowing, swapping, recycling, repurposing, etc), collecting (accumulating, piling up, archiving, etc), playing (competing, participating, challenging, etc), revising (reconstituting, replaying, imitating, copying, reconnecting, etc), transmission (sharing immaterial knowledge, cultural codes, codes of identity, etc). All these actions are linked by a common theme – that of “collection” – which has key importance in the framework of Insiders. This theme – which subsumes notions of selecting, bringing together, highlighting and preserving items within a whole – forms a common thread in folkloric, artistic, anthropological and museographic processes. All the propositions selected for the exhibition involve the idea of collecting objects, information, singular events and minor stories, whose modes of transmission might include raw archives, documentary films, themed museum displays, storytelling and performance. As these modes of expression are so very diverse, the exhibition avoids a synthetic approach, attempting more disparate form somewhere between order and chaos, akin to a choral recitative.